- First, you cut the colored foam sheet into one sheet, then doubled back round and continue to cut into pieces left. Use a black pen to draw a broken half melon seeds pink circle shaped piece of melon. - With half plate light blue circle: you draw a little white dot in the middle and small black dots around shaping pieces of kiwi. - Next, we cut pencil eraser head cut into triangles, printed in orange above the yellow semi-circular plate shaped orange cloves. - Finally, we glued foam forms on top of the wire rope brightly colored fruits and bring enough drape is finished then! - You cut into 4 sheets of paper in orange circle, doubled. Paste ½ of the plate first round with half circle of the second sheet. - Next, we paste ½ 3rd pie plate with half of the circle of the second sheet. Place the wire in the middle third round, 4th round stickers concealed inside the rope to form a sphere. 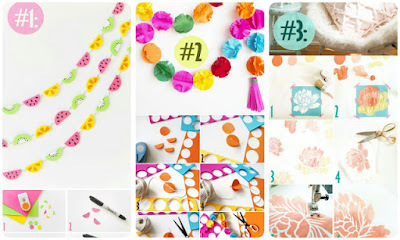 - Use scissors to cut tassels border around the edge of the circle of the sphere. Similarly, you paste into wiring more orbs with different colors for decoration is complete. Extremely simple, right? - First, you put the plate on the plate pattern flowers on white tissue paper, stickers fixed borders.Then, we use dot onto palm shaped flowers to dry. - You cut flowers external borders. Flowers superimposed onto another sheet of white paper, stitching around the edge of the petals, offset a segment for stuffing newspaper inside. Then we stitch it closed the gap to swell to produce flowers look better. - You do the same steps to add many other flowers and leaves. Finally, we inserted needles into each vertex flowers, hanging wires threaded into the decorative finish.